Is there a way to crowdsource restaurant intel while empowering both small businesses and their customers? 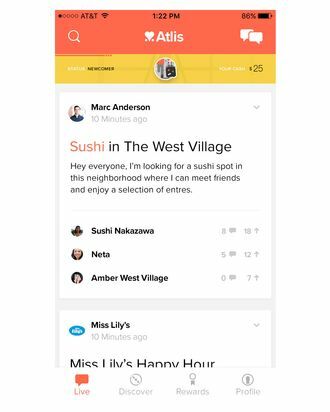 Atlis, a nascent social network with the service aspects of Yelp, is going to try. Users can post an “ask” — What’s a great brunch spot in the West Village? — and receive tailored recommendations from friends and like-minded New Yorkers (the only city in which Atlis is currently available). As an incentive for engagement, founders Nadav Eitan and Daniel Leon are literally paying users to offer recommendations. If you make a successful referral, you receive $5 in cash, which can be transferred directly to your PayPal account. (Atlis says it can “close the loop” through location tracking. And if multiple people recommend the same place, only the first person to do so receives the credit.) This takes the OpenTable model one step further by offering real cash, instead of mere “points” that you’d probably never redeem anyway. Yelp, which reportedly is worth $3 billion these days, has the legal right to manipulate the order and appearance of its own listings — a practice that can hurt restaurant owners and put them at the mercy of someone’s bad day. The tips on Atlis — which span beyond restaurants — are exclusively positive, and tend to be shorter and more direct. You can also follow your friends, and it’s relatively simple to check out their picks. There are still kinks to work out, but the start-up has already raised $2 million, and Google’s business team identified it as one of ten emerging companies with high potential for growth. You can grab it here.